PROFESSIONAL DENTAL OF CLARKSTON IS COMMITTED TO NOT ONLY OUR PATIENT’S DENTAL HEALTH, BUT THEIR OVERALL HEALTH, WELL BEING, AND QUALITY OF LIFE. 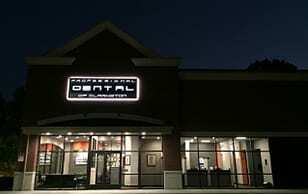 WE ARE VERY PROUD TO BE ONE OF THE VERY FEW DENTAL OFFICES IN THE METRO AREA TO OFFER A HOME SLEEP STUDY. A Home Sleep Study is a rather simple, quick, and inexpensive way to screen for a potential life threatening condition called OBSTRUCTIVE SLEEP APNEA. The study is done in the comfort and convenience of your own home and bed. The device we use is FDA approved and is called the “Medibyte” from Braebon Medical Corporation. This device delivers similar data in comparison to a typical overnight sleep lab. CLICK HERE TO SEE WHAT A SAMPLE HOME SLEEP STUDY REPORT LOOKS LIKE! Mild Sleep Apnea: This is when a patient has 5-15 “Apnea events” per hour of sleep. Moderate Sleep Apnea: This is when a patient has 15-30 “Apnea events” per hour of sleep. Severe Sleep Apnea: This occurs when a patient has greater than 30 “Apnea events” per hour of sleep! Obstructive Sleep Apnea left untreated, can put you at increased risk things such as: Hypertension, Arrhythmias, Myocardial Infarction (Heart Attack), Cerebral Vascular Accidents, Pulmonary Hypertension, Congestive Heart Failure, Atrial Fibrillation, and Stroke. ALSO, THERE ARE MANY CLUES INSIDE OF YOUR MOUTH THAT WE LOOK FOR THAT COULD INDICATE OSA! WHAT CAN I DO TO FIND OUT IF I HAVE A PROBLEM? 1. Overnight Sleep Study (PSG). A PSG (or Polysomnogram) is conducted in a sleep laboratory or hospital setting. It is one in which you have to stay overnight and are generally monitored by other professionals while you are sleeping. WHAT DO I HAVE TO DO TO SCHEDULE A HOME SLEEP STUDY? We simply schedule a brief appointment for you to come into our office. You will then fill out specific sleep questionnaire paperwork. Dr Davidson will then meet with you to determine if you are a candidate for a home sleep study. He will then answer all your questions and address any concerns you may have at this time. Often, you can do your study that same night! You will then simply return the monitor to our office after your two night study is completed. The data and report will then be evaluated by Dr Davidson, a Registered Sleep Technician (RST), and / or a Sleep Physician when appropriate. After that, we will generally appoint you back in our office a few days later to review your results and discuss any action that may be appropriate. See the photo below of what the Home Sleep Study Device actually looks like! Call our office today at 248-620-6200 to learn more on how we may be able to help you with the initial screening and treatment of Obstructive Sleep Apnea and snoring using the FDA approved “Medibyte” home sleep monitor.